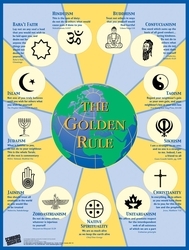 The Golden Rule poster is a colorful and inspiring multifaith poster including ancient precepts from 13 religions. The poster focuses on the Golden Rule as not just a moral ideal for relationships between people, but also for relationships among nations, cultures and religions. 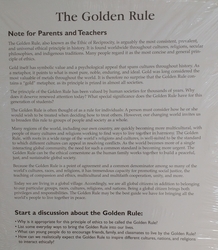 The Golden Rule poster is permanently on display in the United Nations as well as in schools, churches, universities, hospitals and workplaces. The large Golden Rule poster measures: 22” x 29” and comes in English. A smaller version is also available in packs of 25 and measures 8 ½” x 11”. This mini-poster version is perfect for use in the classroom or at the office. Discussion starters (pictured bottom left) are included on the reverse side. 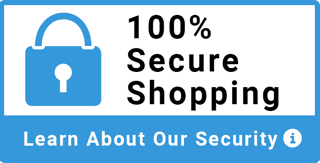 Click the appropriate button below to order this item. To support educators, a free copy of "Guidelines for Creating and Facilitating a Workshop" on the Golden Rule poster is available as a ready-to-download workshop guide.